our Labs program for Google Code. This program provides clear distinction between graduate developer products where you’ll find mature products with transparent deprecation policies which you can count on for the long run, and labs developer products where you can explore our newest products and get started with them early. We've just finished collecting final evaluations for our fifth Google Summer of Code, our flagship program to introduce college and university students to Open Source development practices. With nearly 3,000 mentor and student participants this year alone, this global initiative has brought together thousands of developers worldwide for the past five years, all for the love of code. For more details about the final results of Google Summer of Code 2009 and information on when to find the source code produced by this year's crop of students, check out the Google Open Source Blog. 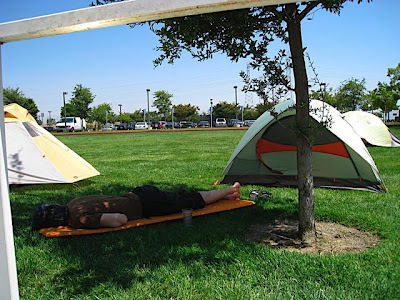 The Silicon Valley Google Technology User Group (GTUG) held the first GTUG Campout, a 46 hour hackathon, over the weekend of August 7-9. Nearly 200 developers, designers, and business people came to build working applications using Google Technology, focusing largely on the Google Wave API. The event was intense, spanning 3 days. In that time, attendees had to pitch ideas, form teams, and code like heck to have a working prototype to demo by Sunday evening. Friday evening, we had over 50 pitches. Afterwards, people had a chance to mingle and find teams that they wanted to work with. Groups whiteboarded and discussed their ideas, then started working hard. 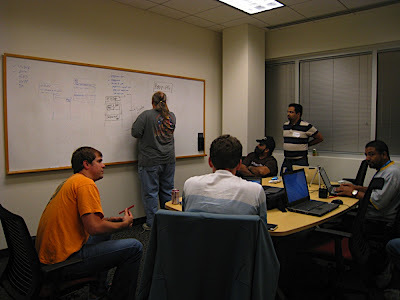 Over 30 coders were still working past 2:00 am Saturday morning. Sunday night we had 32 presentations of working applications followed by wooden nickel style voting to determine the winner. 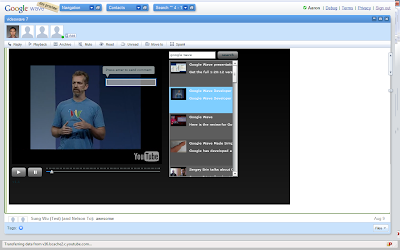 The crowd chose Videowave, a Wave gadget that allows synchronized viewing of videos from YouTube. They were awarded 1 pass to Google I/O '10, 2 G1 phones, and lunch with members of the Wave team. Android app and mobile web app for emergency medical situations. If launched, app locates you and notify authorities and emergency contacts. Wave-Email Gateway that lets non-Wave users to participate in Wave. Measures hostility level in a Wave. If too high, hijacks thread and geolocates participants and suggests nearby drinking establishment. Robot and gadget components. A Wave gadget - JS toy for drawing and editing cute boxes with your Wave friends. Congratulations to all the winners and other attendees who worked so hard! Thanks also to the Googlers who helped out and answered questions, and our volunteers, especially those that helped with videos and photos. The Silicon Valley Google Technology User Group is one of the first GTUGs around the world. Today around 70 GTUGs exist worldwide. Information about starting a GTUG in your area can be found at http://www.gtugs.org. The first GTUG Campout was a great success and we are looking forward to doing the event next year, and hope other GTUGs will host GTUG Campouts in their neighborhoods. Update: Video and some images courtesy of Shirley Lin of WooMeOver. Please also check out our CS Resources page for updates on useful training materials. But that's not all! We want to encourage educators to contribute their great content to Google Code University. By implementing a submission form we hope to make the process easy and convenient. Just follow the big blue button on the homepage and tell us about your materials. We look forward to hearing from you! for event-driven notification, syncing, chaining, modification, and extension. One simple example of programming the web itself is the post commit-hook on Project Hosting, which lets developers call their own web service every time someone commits to their repository. An advanced example is the Wave Robots API, which gives developers the power to enhance and modify the behavior of Wave in new ways that no-one has envisioned. The magic of this programmable approach is that these services come to *your* webapp whenever something requires attention; there's no need to poll for events or data that you're interested in. In keeping with this goal of programmability, over the past few weeks we've enabled the PubSubHubbub protocol for many Google services, including FeedBurner, Reader shared items, and Blogger. This protocol provides web-hook notifications when Atom and RSS feeds are updated, delivering web applications near-real-time information about what's new or changed. Today we're happy to announce that we have gone a step further and added PubSubHubbub support to Google Alerts. This gives developers the means to write web applications that process newly relevant search results as they become available. Think of it as an AJAX search API that tells *you* when it finds new results. Acting upon these notifications your app could update your website, email friends, send an SMS-- the possibilities are endless. Like the huge number of Maps mash-ups out there, we hope to see a whole new class of applications built on top of these notifications. So give the protocol a try and tell us what you've built in our Google Group! Why shouldn't the web itself be programmable? A programmable web enables one application to be extended by another to create new applications that people haven't imagined before. This goes beyond mash-ups, which primarily combine data sources together into new views. A programmable web is reactive and relies on Web Hooks for event-driven notification, syncing, chaining, modification, and extension. Google Developer Days 2009: New Locations! , a set of one-day developer events, are returning to Eastern Europe and Russia this fall. At Google Developer Day, attendees learn about Google developer products from the engineering teams who built them. These events are an opportunity for developers with strong coding experience to delve deeper into our APIs, developer tools and applications. There is also plenty of time to interact among the developer community and with Googlers themselves at "office hours," during which developers can bring their own snippets of code or specific product questions to the Google engineers behind the product. Save the dates as the official websites and registration for both events will be available soon. Hope to see you there. After a successful set of Google Developer Days in Asia and Brazil this past June, Google Developer Days 2009, a set of one-day developer events, are returning to Eastern Europe and Russia this fall. 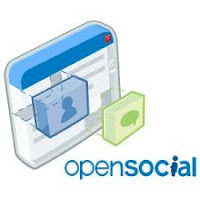 Developers using the OpenSocial API can now reach tens of millions of iGoogle users! As of this week, iGoogle now supports OpenSocial in both the US and Australia, with the plan to roll it out to more users soon. In general, we think "social is better" when it comes to the web - activities such as reading the news, doing a crossword puzzle, sharing a todo list, or watching a video are all better when done with a friend. 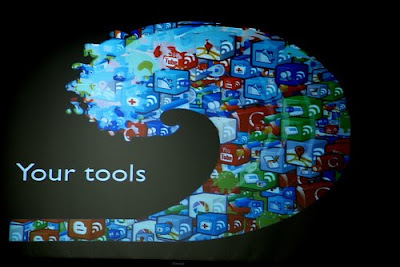 These are all things that iGoogle users love to do, so making them social on iGoogle was the next logical next step. If you're interested in getting started writing social gadgets for iGoogle, check out the full announcement on the iGoogle developer blog.